Our Association Secretary recently received this information regarding this Royal Victoria Yacht Club celebration race on Sunday, apparently they are very keen to include as many SCODs as possible. Marbella is taking part and Mark's edwardian sailor suit has already been collected from the dry cleaners. The Olympic Regatta was held over three days from 27th to 29th July, 1908, the first year that Olympic sailing took place in the UK. The racing was held in the Solent starting off the end of Ryde Pier and was undertaken, at the request of the British Olympic Council, by the Council of the Yacht Racing Association (now the Royal Yachting Association) and was hosted by the Royal Victoria Yacht Club using new, simplified, International Yacht Racing Rules. 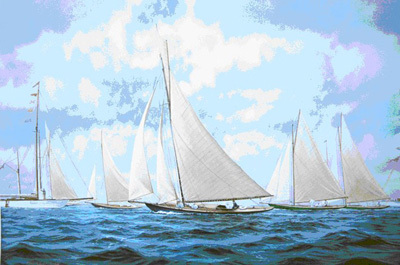 The Centenary of this historic sailing occasion will be celebrated with a series of events to be held during Cowes Classic Week, and all members and classes of boats are very welcome to attend. In period costume, open to all, including keelboats and classic classes, with simultaneous firing of guns at the RVYC exactly 100 years to the hour of the original regatta. Messages of goodwill and encouragement will breeze through the ether to our brave crew of sailing Olympians in Beijing. This will be followed by a cream tea. During the summer, the Classic Boat Museum Gallery will be featuring an exhibition of the 1908 Olympics.